If you have your Android phone for a longer time already, chances are high that you saved a large number of different WiFi networks on your device. Automatically connecting to all these networks is super convenient, but what do you do if you need to connect another device like your laptop the first time to one of these networks? Of course, you can always ask again for the password but what if the person who knows it is gone? Seems like you’re stuck with your Android phone to surf the web. Thankfully, that’s not true if you’re Android device is rooted. Having root access to your phone allows you to open up a certain config file that contains passwords to all saved WiFi networks. As already mentioned, for this to work you need root access to your Android phone. In case yours isn’t, check out the links above which help you understand what rooting is about and how you root your device. To get to your stored WiFi passwords, you need to have a file explorer app that supports root users. Two explorers I personally use and recommend are ES File Explorer (free) and the more sophisticated Root Explorer ($3.99). Although I only used Root Explorer for root purposes so far, ES File Explorer also offers a root explorer feature. So, if you only need a simple and free solution, use the latter. Open up ES File Explorer or Root Explorer. 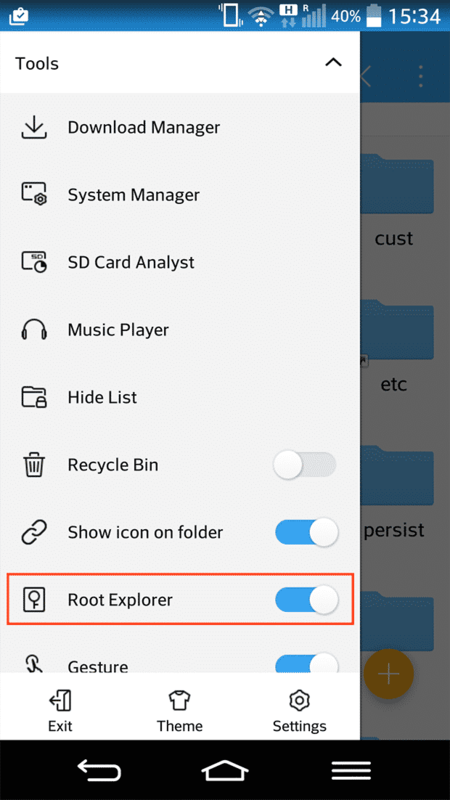 If you use ES File Explorer, you need to enable the root explorer feature in the app. To do so, tap on the list icon on the top left corner, scroll down to “Root Explorer” under the dropdown “Tools” and enable it. You should now get a root permission request via Superuser or SuperSU (depending what you have installed). Once you grant the request, you can use the app to access root folders. From your phone’s root folder, navigate to data > misc > wifi. Look for a file with the name wpa_supplicant.conf or wep_supplicant.conf. Since most networks use WPA encryption, you’ll probably find the password you’re looking for in the wpa_supplicant file. Selecting the file should open it up in the file explorer’s own text editor. Now, you can simply scroll down the text file to search for the network you’re looking for (next to “ssid”) and find its password next to the term “psk”. That’s it! I hope you were able to go through all the steps without any problems. If so, feel free to drop a comment below.